Harissa is a Tunisian hot chili paste that is used in a lot of foods from stews to vegetable dishes. The one that I chose for this recipe has rose hips added to it which add a nice floral note and it helps enhance the pepper flavor quite a bit (Rose Harissa), this is not the exact product that I used but it is still a very good product. I have enjoined pickles so much more since I have been making them from scratch, I have made fermented pickles and vinegar based pickles, both are very good when done properly. This recipe will demonstrate a vinegar type pickle and I am going to use English cucumbers. These cucumbers add a nice cooling effect to the hot chilies in the harissa, and with the addition of palm sugar, you get a nice fruity sweetness. 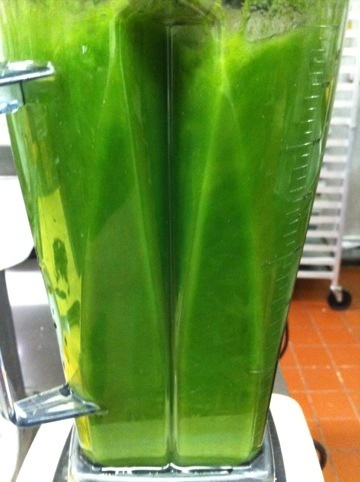 Start by rinsing the cucumbers and removing both ends. Cut the cucumber in thirds so you have three cylinders. Combine the remaining ingredients in a pot and bring to a simmer. Meanwhile place the cucumbers in a jar to fit them all and the liquid. 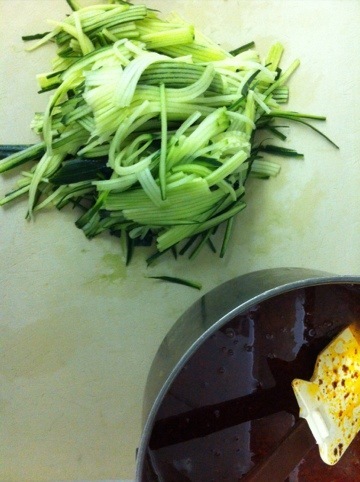 Julienne cucumbers and harisaa marinade. 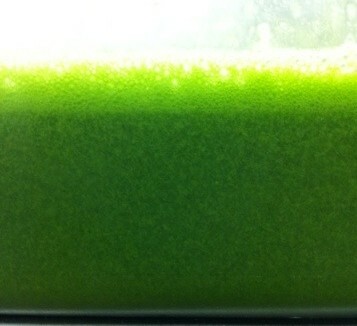 Once the mixture has come to a simmer, pour it over the cucumbers and cover with plastic. refrigerate overnight. 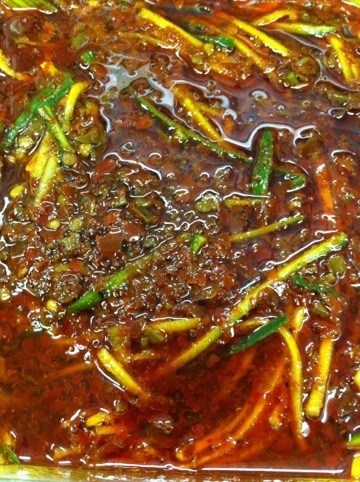 Cucumbers pickling in warm marinade. 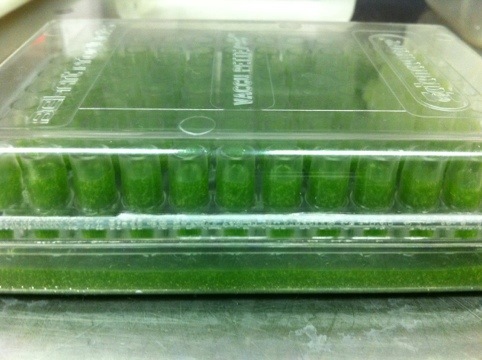 The pickles will be ready after 24 hours but will improve over the next few days. 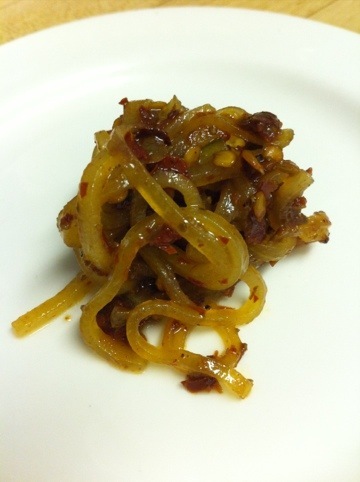 I served these pickles with a warm charcuterie board that has homemade sausages and confit duck. 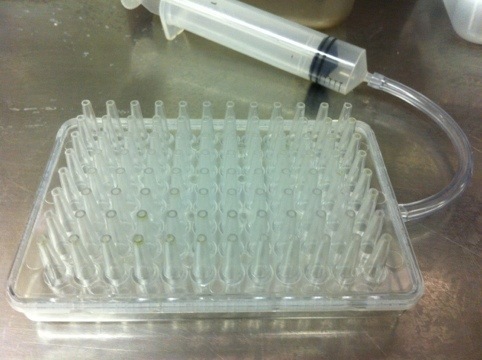 The acidity level was about 4.0, so these are ready for canning! 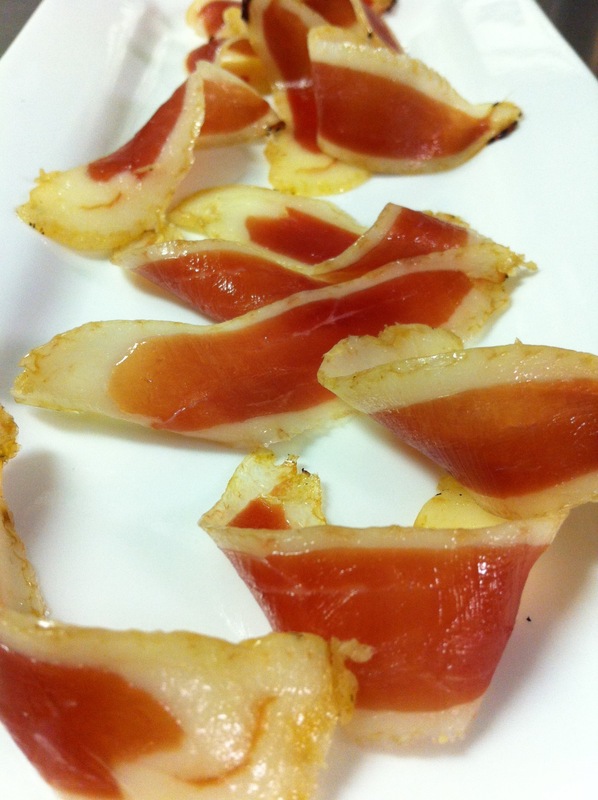 As much as I love prosciutto, it can be a very expensive investment and once it has taken its sweet time to cure and age it should be eaten quickly, although it can be portioned and placed in the freezer to make it last longer. Since I am only making prosciutto for myself I decided to use duck breasts, they are easier to work with when beginning to cure meat and it will fit in my larder better than a full pig leg. The technique that I am about to show you came from a butcher in Portland, OR, that I learned to cure meat from by the name of Eric Finley, Chop, Butchery & Charcuterie. 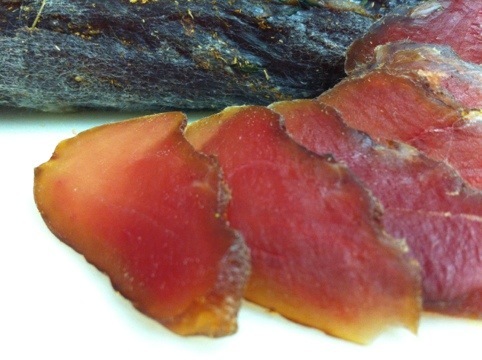 For my first run of duck prosciutto I am going to use Peking duck breasts, as they are more common and cheaper. They have a decent amount of fat on the breasts and a pretty neutral duck flavor, since they are farmed and not wild. The trick to a good prosciutto is to cure and age the meat encased in fat/skin to prevent the flesh from spoiling and drying out. 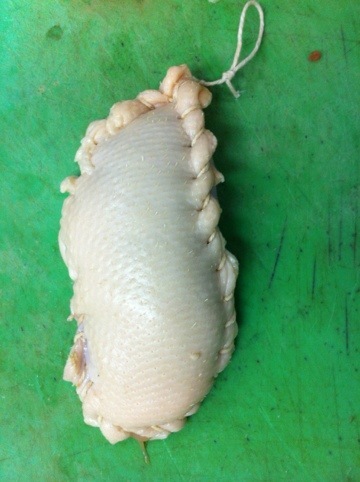 To ensure that the meat is fully encased in fat I am going to sew two duck breasts together by the skin. Doing this will give me a larger portion of meat to serve as well as the fat, which will absorb the flavors of the cure. I created two samples and the duck breast that was sewn together will be the first, for the second, I decided to take a different approach. I recently picked up a small amount of “Meat Glue”, or Transglutaminase/Activa (not to be confused with Activia®) from Modernistpantry.com to play and experiment with. For those that do not know what this product is you can read about it here. Instead of sewing the breast together, I “glued” them together, and after 24 hours of setting time for the glue to activate, I had conjoined duck breasts that were ready for curing. Start by laying the flesh side of the two duck breasts together to determine whether the fat will be able to encase the meat. If it doesn’t, do not worry, you will just need a little warm duck fat later to rub onto the flesh. Sprinkle a pinch of pink salt onto the flesh side of each duck breast and begin to sew them together. 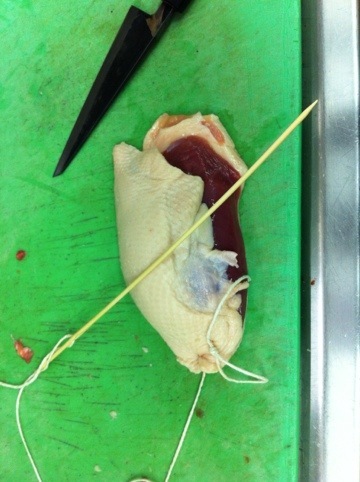 I tied a loop with a knot in one end that will hold the twine in place and allow me to hang the duck after it has cured. I made my needle out of a wooden skewer. 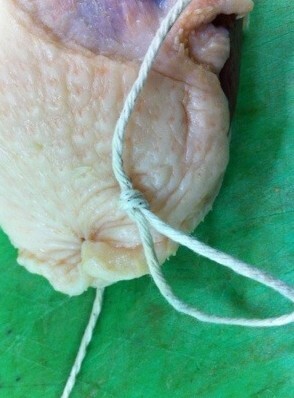 Begin sewing the breast together, only penetrating and sewing the fat together all the way around the duck breasts. And to think that the home economics classes I took in middle school would finally pay off. Once sewn together, check for any parts of flesh that might be exposed, if there are any just mix a little bit of warm duck fat with ground black pepper and rub it onto those areas. 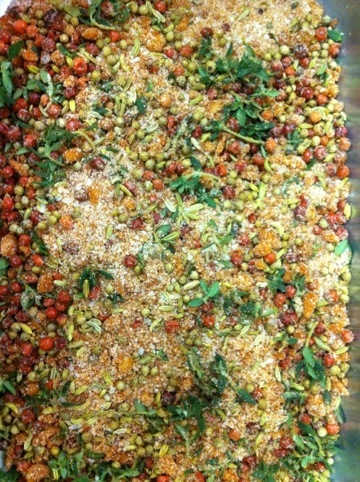 Combine dry spices and pulse in a food processor. In a bowl combine all ingredients, except duck and mix well. 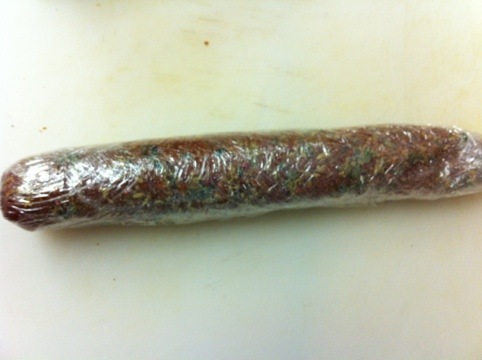 Toss the duck in the cure, lay a handful of the cure onto a sheet of plastic wrap. Place the duck on top followed by another handful of cure. Wrap the duck and the cure tightly in the plastic to ensure that the breasts are completely covered in cure. 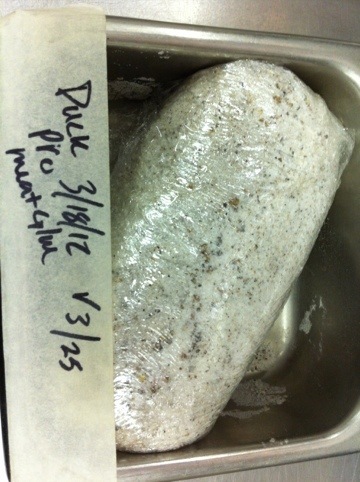 Label, date, and apply about 10# of weight on top of the duck breast, the weight will help it cure faster. Place in the fridge and cure for seven days. 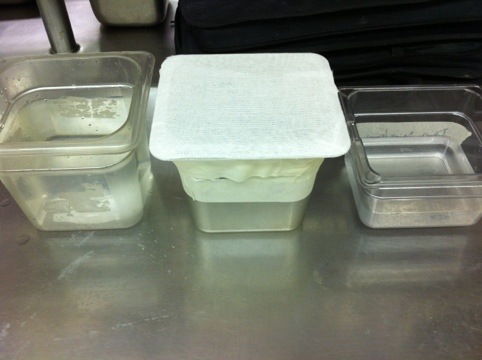 Remove the duck from the plastic, reserving the cure, and check for firmness, it should be uniform. 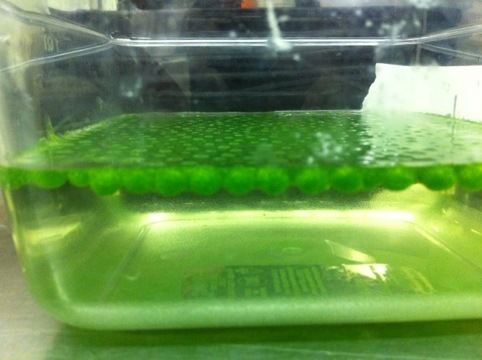 If it is still soft in some spots, which mine was, then re-apply the cure, mine will take another three to four days. Re-applying the cure to my duck breasts and wrapping and storing for 3-4 more days. Once the duck has finished curing it should feel firm. For the one sample that I used meat glue on I did not apply any weight, and it was not entirely firm but it ended up more round than the one that was weighted, which turned out flat. I brushed off the cure and hung both prosciutto’s in the larder. 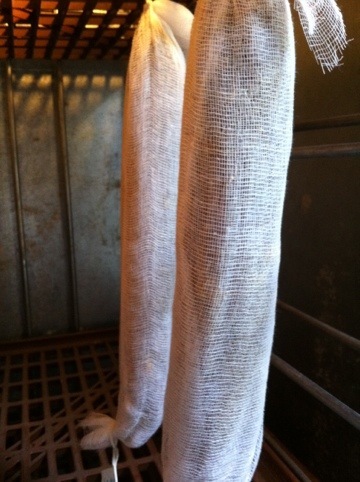 I wrapped one with cheesecloth and left the other unwrapped. These will age anywhere from one month to three. The meat glued and un-pressed duck breast was unsuccessful, not because of the meat glue but because the breast where so thick it took too long for it to lose moisture being encased in fat. In the future I think this one would work better if I cured it longer, it was not quite firm enough and I should have left it in the cure for another week. 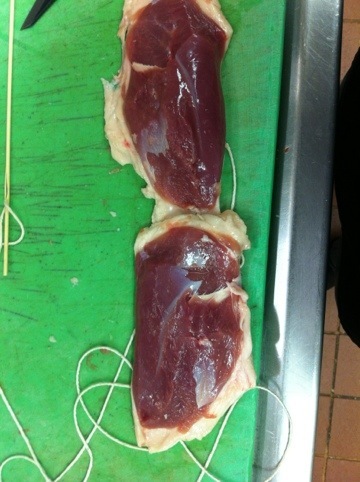 The sewn duck breasts, that were also weighted, turned out very well. The meat was encased in a very flavorful fatty skin. There isn’t much more to say about it except, Wow! Next time I will look at using Muscovy duck breasts as they are almost three times the size. 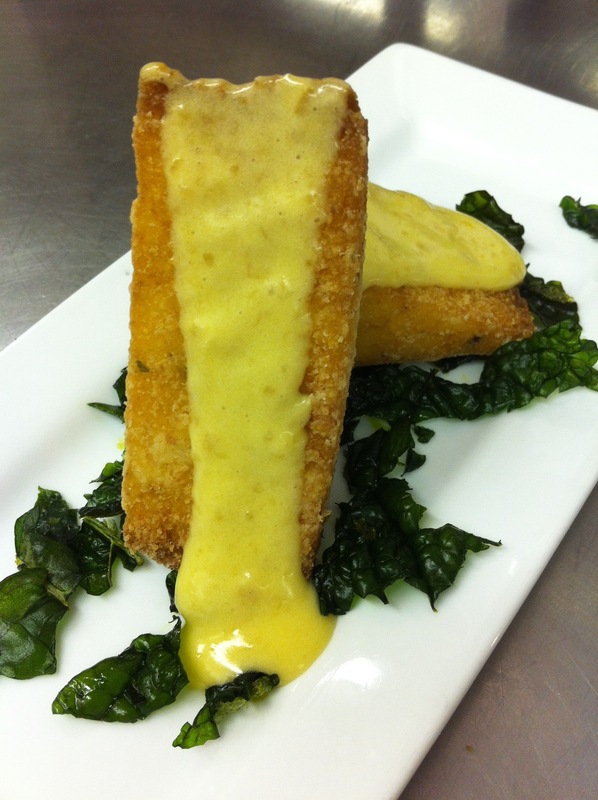 Polenta is right behind risotto on my list of favorite starches, and as requested here is the recipe for the crispy polenta that we serve at the Lodge restaurant, not only as a side but as a starch on our broccolini salad. 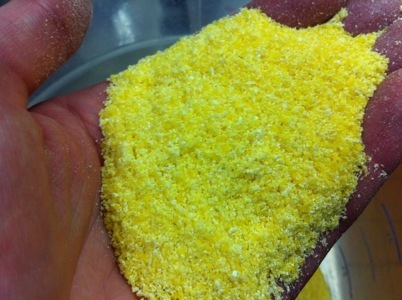 Polenta is a coarsely ground, sometimes finely ground, cornmeal that is cooked in a stock to create a porridge type dish. It has been around since the Roman times and before corn was introduced it was made from faro, spelt, chickpeas, and other starchy flours. The leftover porridge is often poured into a pan and served the next day grilled or fried. In this recipe we use a coarse ground cornmeal that is labeled as “Polenta”, the coarser the cornmeal the longer the cooking time. I prefer to use coarse cornmeal because of the texture but as stated above you can use almost any starchy flour. 2 pans to pour the polenta into, 9″ squares pan works well. One pan will hold the polenta and the other will act as the weight on top. Begin by getting all of your ingredients scaled out, then combine your cream and chicken stock in a pot and place on high heat. Add salt and pepper to taste at this point. 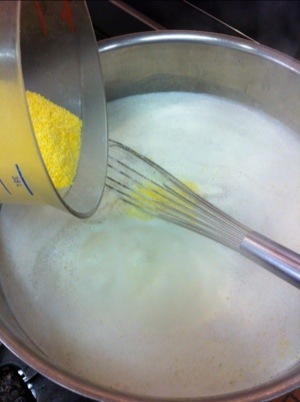 Once the liquids boil, whisk in the cornmeal, immediately turn the heat down to low. Continue to whisk until the porridge has thicken, be careful at this point as the pockets of steam will create little volcanoes that can sometimes shoot searing hot polenta at you. 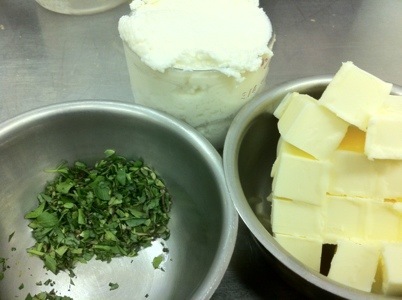 Once thick, remove from the heat and add the remaining ingredients. 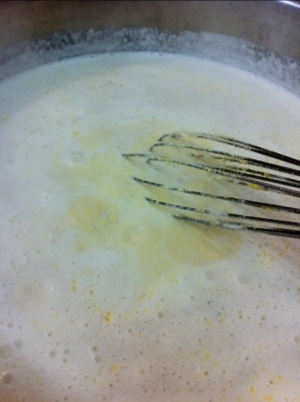 Continue to whisk until the butter has melted. The use cold butter allows the butter to stay emulsified, therefore it will not separate unless over heated, same theory applies when making a butter sauce or mashed potatoes. Pour the polenta into your baking pan and let cool for ten minutes, no need to grease the pan, between the cream and the butter, the polenta will pop right out once cooled. Place a piece of waxed paper or parchment paper ontop, followed by the second baking pan, pour a little water into the top pan to add some weight. 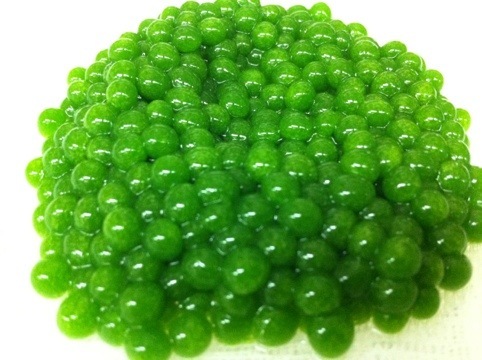 The weight will make the product more dense for the purpose of frying. 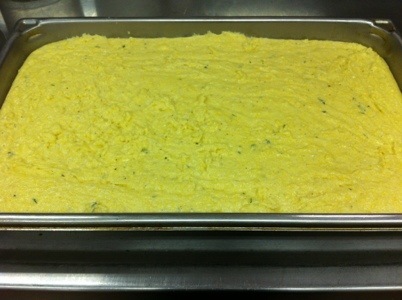 Place the polenta in the fridge and allow to cool overnight. 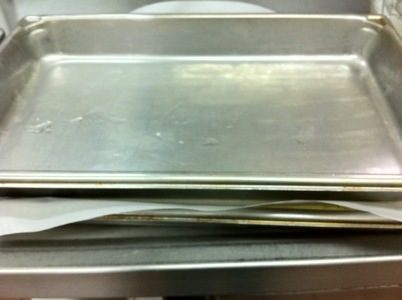 Once cooled remove the top baking pan and flip the polenta out on a cutting board. 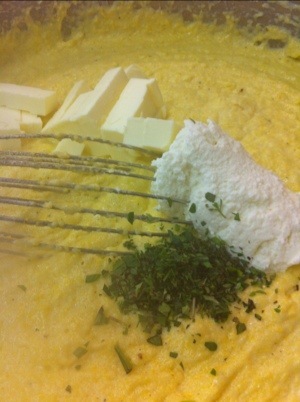 Using a wet knife, cut the polenta into the desired shape. Toss the polenta in cornstarch, the cornstarch fills in all the little gaps and protects the polenta from falling apart in the fryer. 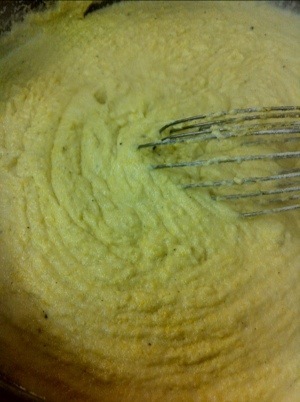 Fry the polenta until golden brown and enjoy! Whichever way you want to call it, lonzo or lomo has a great background. Lonzo is from Italy and lomo is from Spain. There is even a version from Greece that uses red wine in the cure and is referred to as lountza. This is another great piece of charcuterie history! Lomo can be and mean many things; in Spanish it means loin, traditional lomo would be beef tenderloin, and lomo de credo translates to loin of pork. 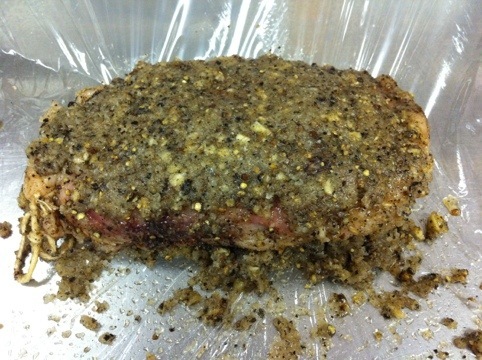 Most of the lomo that I have had has been the tenderloin of pork so that is where I will begin. 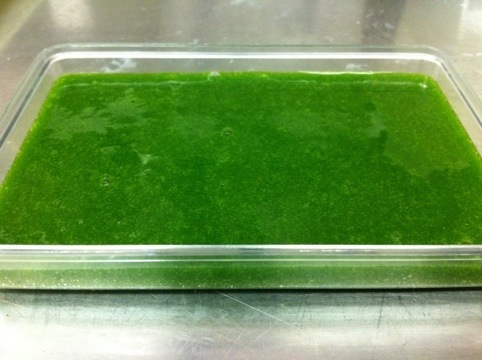 This piece of cured muscle is a great way to start curing at home, the cut is small and not terribly expensive. The spices that are used are very aromatic and distinct, you should be able to pick out every spice that you put into it. The curing time is relatively short as is the hang time compared to the curing time of a whole loin because of its size. For my lomo I am using Carlton Farms, based out of Carlton, Oregon, because they are a local and reliable source for great pork. Combine all of the ingredients for the cure. Dry the pork with some paper towels and roll them in the cure. Lay out a piece of plastic wrap and sprinkle with 1/4 of the remaining cure, place pork on top and add 1/4 more of the cure. Roll the plastic around the pork tightly and place the loins in the fridge for 4 days, some recipes have said 1-2 weeks but that is for a loin of pork which is twice as thick. I went with the same curing time as my bacon to ensure that it does not get over cured. 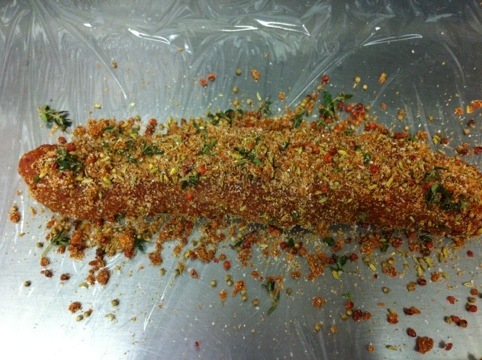 Check the pork daily and flip it over on its other side, when done the tenderloin should feel firmer than in raw form. After your curing time is up, unwrap the pork and rinse under cool water to remove excess cure, and pat try with paper towels. 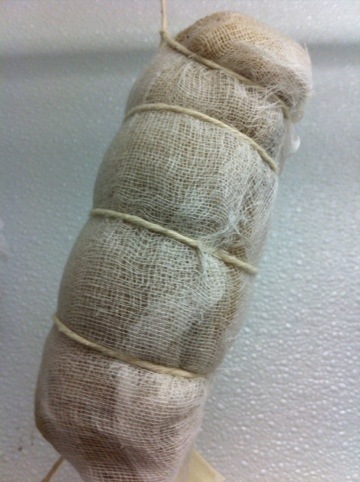 Wrap the tenderloin in cheesecloth and hang until it has lost 30% of its weight. I am estimating it to be close to three weeks, again I have a chart that I will record the weight of the product every week to track when it is done. 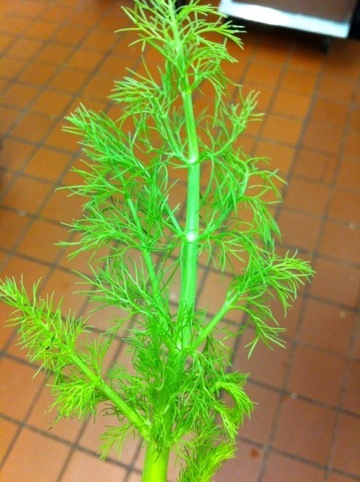 Come join Black Butte Ranch on Foodspotting and help spot the food you love and want! If you are not familiar with Foodspotting then you are missing out on the best visual reviews of restaurants. It allows you to find and recommend dishes, not just restaurants. All you need to do is download the app, spot a dish that you love, snap a photo, and it will pin your location to the picture; you just need to add the name of the restaurant and your opinion on the dish. Here are a few dishes that were spotted at The Lodge Restaurant! Corned beef shortribs with a goat cheese stuffed leek, grilled fennel, and a harissa hummus. Griddled elk loin, chicory salad with fresh parmesan, soft poached egg, smoked tomato vinaigrette, and pave potatoes. Crispy duck neck with a port pomegranate sauce, and sweet onion jam. Don’t forget to follow me and see new spots and food first! 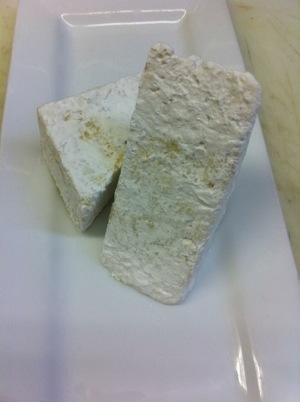 Creme fraiche is an expensive cream similar to sour cream but a little richer. 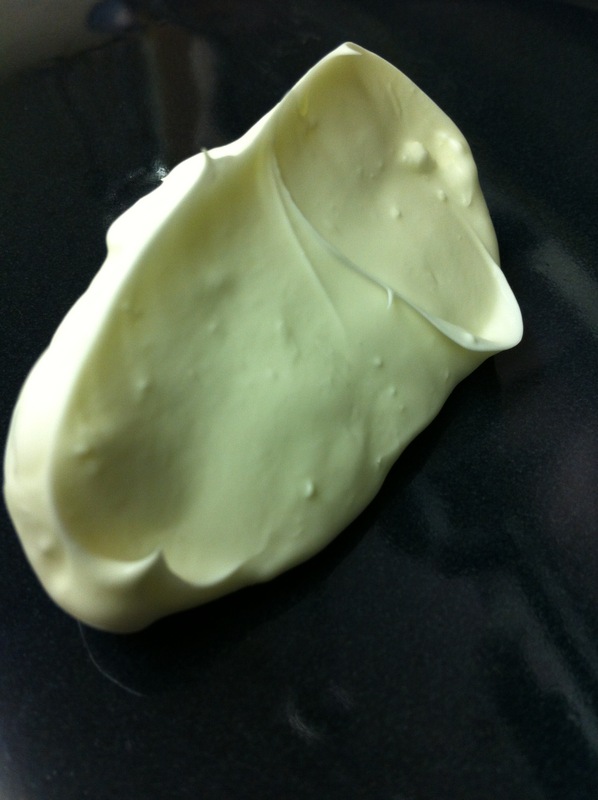 I have been eager to make creme fraiche since I have read about how easy it is to make. The problems I ran into had to do with keeping the milk mixture at a consistent temperature for twelve hours to allow the bacteria to form. After building the immersion circulator, I have had to start testing it by making yogurt and creme fraiche, due to the lack of a foodsaver/vacuum chambers to pack food in for Sous Vide cooking. Like yogurt, creme fraiche is very easy to make yourself and once you have the culture started (from your first batch of creme fraiche), it is very inexpensive to make. Combine both ingredients and mix. 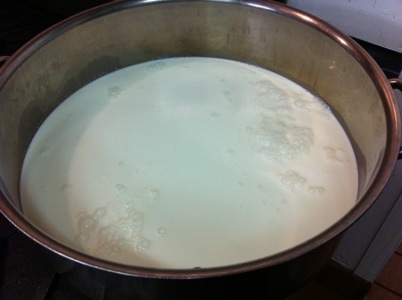 Place the mixture in a quart sized mason jar and submerge in a water bath to the height of the milk in the jar. I used a pan in my water bath to get the jar where it needed to be. Cook at 95°F for 8-12 hours. The longer it cooks, the more sour it will taste. After the time is up, place the jar in an ice bath to cool, then refrigerate.